At Doggy Dates, we’re posting the dog walking jobs Boston locals want to see. Make every day a fun-filled playdate when you apply for one of our open positions. Today, many people struggle with choosing a job or career path. Doggy Dates serves as a great beginning to a career in dog care or a transitionary step to another career path. If you love dogs and want to spend your days facilitating doggie playtime, we’d love to hear from you. We’re on the lookout for part-time and full-time dog enthusiasts. Apply now! As you search for dog walking jobs in Boston, think about your ideal work environment. Doggy Dates provides a different kind of dog care position. Our team members are more than dog walkers. They’re play supervisors, drivers, and overnight hosts who invite each dog into the Doggy Dates family. 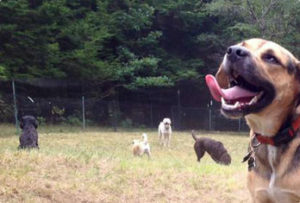 Conventional dog care requires employees to show up to an institutional-like building and work in confined quarters with a large number of dogs. While this sort of service has its place, we believe in a different approach to dog walking jobs in Boston. When you work with us, you’ll have a great deal of freedom and responsibility. We trust each of the employees we hire to manage their time effectively and according to schedule, and we empower them to make decisions throughout the day. For example, if you need to spend a few extra minutes making a new client or his or her dog feel comfortable, you’re making a good decision for the future of the company. If you have a concern about one of our playdate guests, we want to hear it. As long as you maintain strong communication with management, we provide a 21st-century employment experience. When it comes to dog walking jobs in Boston, you won’t find another opportunity like this one. The pet care professionals we hire are people we can trust to show up on time, drive responsibly, and meet our expectations during every playdate. For our dog walking jobs in Boston, we welcome employees who are willing to work with us to create schedules that work with both our clients and their pets. We do hire both part-time and full-time playdate supervisors to help our employees meet the demands of their active lives. However, we expect each employee to stand by his or her commitment to the work and stay in constant contact if something changes. Our dog walking jobs in Boston are fun, but they are professional, too. If you don’t have any pet care experience, don’t strike our company off the list just yet. We don’t require our playdate supervisors and overnight hosts to have a certain amount of job experience. We do, however, want to make sure that each of our employees understands the nature of dogs and best practices for caretaking. These dog walking jobs in Boston go fast, so think about submitting your application soon. Our team trains all the employees we hire based on our standard of care. If you can demonstrate a willingness to learn, passion for the work, some work/school/volunteer/life experience that demonstrates reliability, and a friendly demeanor toward animals, we will consider you for our open positions. Learn more about the backgrounds of our existing staff members. Depending on the position you apply for at our dog walking jobs in Boston, you may spend a significant amount of time transporting dogs to and from our play area and entering our clients’ homes. We need to know we can trust all our employees to treat our property and others’ property with a high degree of care. From following client instructions for pickup and drop-off to driving a group of dogs to our acre of fenced-in farmland, include in your application the examples that showcase your trustworthiness. For dog walking jobs in Boston, flexibility is key. We strive to make our services available when our clients need them most. For example, many of our clients call us with last-minute changes (for a fee), and we need to adjust our schedules accordingly. Not all our employees need changing work schedules, but we do need employees who can remain flexible in a changing work environment. Great dog caretakers all have one trait in common. We’re all passionate about what we do. Rain or shine, we’re ready to greet our furry guests and give them and their clients a memorable experience with our services. To see a dog’s face (and tail!) light up when we pull into the driveway and play with their friends at the park makes the job worthwhile. If this sounds like a great way to spend your days, consider our dog walking jobs in Boston. You will love the rewarding experience. Our employees come from all kinds of backgrounds, but they all support our mission to provide an unparalleled dog care experience. Check us out on Facebook, Instagram, and Twitter to learn more, and then apply for our dog walking jobs in Boston. Why Should You Apply For Dog Walking Jobs Boston? When you apply for our dog walking jobs in Boston, you’re not applying for the typical dog care experience. In addition to supporting single playdates, we offer group playdates, overnight stays, and training programs. As part of our team, you can interact with our furry guests every day in a leash-free environment and enjoy the culture of a pet care company that does things differently. We can’t wait to talk to you. When you’re ready to apply for dog walking jobs in Boston, call us at (781) 801-2526.